While TV screens have been expanding in size to the point where you could almost measure their area in acres, LCD monitors have maintained a relatively static size of 17 or 19 inches on the diagonal. The new VP2130b ups the ante by offering a 21.3in display, squeezed into an ultra-thin bezel that manages to keep the overall dimensions on the desktop manageable. Bigger isn't always better, but the main strength of this larger than average format is that it's backed up with an equally impressive 1,600x1,200 maximum resolution. 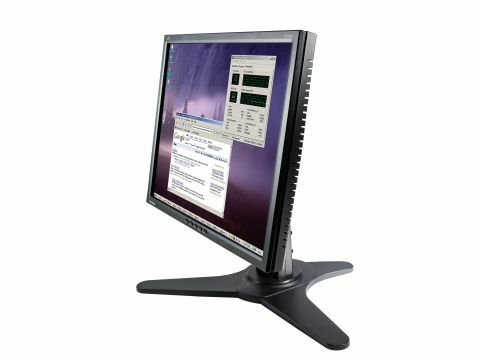 This makes the monitor a good choice, in theory at least, for highresolution photo viewing and editing, as well as for multitasking, with several programs taking up residence on the screen simultaneously. Sticking with digital imaging for a moment, the VP2130b has an sRGB setting option. In our tests, it maintains a reasonable colour match with like-minded printers, but lacks definition in highlight areas, with light greys tending to merge into white. For fine-tuning, there are some natty software controls available via the companion PerfectSuite program, which enables easy yet highly effective setup direct from your desktop, rather than having to fiddle around with monitor buttons and onscreen menus. The software suite also offers a theft deterrence bonus that's bound to find favour with company asset managers: you can lock the monitor to your PC using a unique PIN code. The overall image quality proves sharp and crisp, while vivid displays are ensured by a high maximum contrast ratio of 1,000:1. Expanding its repertoire into the realm of entertainment as well as office chores, the VP2130b's response time is pretty good as well. That said, while ViewSonic quotes a respectable figure of 8ms, this is only recorded for a 'grey to grey' value, and the true 'off- on-off' value is a more lengthy 16ms. The VP2130b scores well in ergonomics, with a 135mm height adjustment on offer, as well as an impressive 270-degree swivel feature. You also get a 90-degree pivot facility to round off the full adjustment features.